I'm downloading photos&videos from a Canon Powershot into Photoshop Elements Organizer 10 on OS X. I want the files to be copied into subfolders named after the [shot date], which worked fine when I used PSE8 on Windows. With PSE10 on OS X the subfolder names seem to be somewhat random for JPEG files: "1913 03 15", "1969 12 31", "1970 02 03", "1970 02 09", "1975 10 04", ... "2026 01 17". The AVI files are all correctly stored in a subfolder named "2011 11 05". Interestingly, the dates displayed for each photo in the organizer is correct, it is just the subfolder name that is not created correctly. I’m hoping you can help with this small issue I am having with the Elements 10 trial. On checking Edit > Preferences I can see my preferred option (yyyy mm dd) is not an option. Why then is the “yyyy mm dd” offered in the Elements Organizer – Photo Downloader view? Photoshop Elements 10: Folder date format on card reader import. Commiserations, you will see if you read all the posts in this thread that you are not alone, and so far Adobe don't seem to care. We are stuck with a product that is 'new but not necessarily better'. My work-around a few posts up and Stephen Johnson's contribution a couple of days later give a way of achieving what you want to do. But surely Adobe you should be letting us know what you propse to do about this serious issue. The silence from Adobe is deafening. Warning do not buy this software if you are based outside US. International dates are not supported in Elements 10! Previous versions did support International dates. The consequences are that imported photos get put in file folders with unusable names. I've commented on your Amazon review, supporting it. Date time issues in elements organizer!!!!!!!!. I notice that Jeffrey Tranberry is 'Product Manager, Chief Customer Advocate - Adobe Digital Imaging' and is apparently following this thread. Jeffrey - have you any news for us please? Yes. I brought this to the Elements development team in December. They are still investigating the issue. Sorry I don't have more info. I assume that you will keep the pressure on them for a quick solution. Yes. I've identified this as one of the key issues affecting Elements 10 users. Hi Jeffrey Tranberry, sounds like they have had some time to investigate. When do you expect to be able to update us on a bug fix? I inquired late last week. The team didn't have a solution yet nor did they have a timetable. It's a shame that as this is a 'key issue', there seems to be no urgency on the part of your colleagues. I find it staggering, bearing in mind the facility WAS available in previous versions and there obviously are a lot of users both OS X and Windows with the same complaint. I have never heard such a cheap excuse from developers. If they are looking for a solution, why don't they read the code they produced in an earlier version? I think Adobe need to move fast on this one as there are a lot of really upset users. Do Adobe really want all the bad publicity from disgruntled users taking the problem to forums, review sites etc. Basically we like your product, but this bug turns an otherwise good product into a pile of dog mess! Please tell how what you are doing to fix this and how long it will take before we have a bug fix! Now that I see how many people also have some issue I am hoping adobe will finally fix the bug. I have been a photoshop elements user since version 5. I am not a professional photographer and I am more than happy with the photo editing capability of the program. However when the organizer was developed I was hooked. Besides all my own photos, over the past two years I Have spent Many hours converting older family photos and slides into digital format. I restored many of the older photos, some pre 1930"s, and have been very happy with the results. In addition to all the time fixing I spend quite a bit of time researching the names of old family members in this photos as well as the best guess DATE, even if just a year. 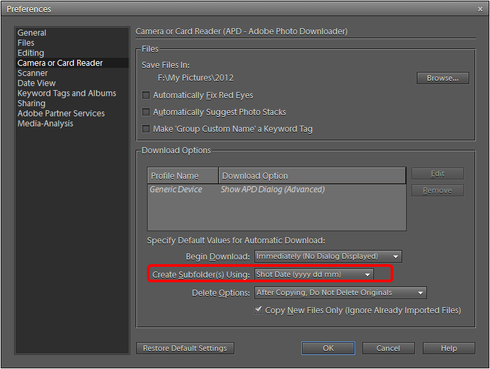 After a photoshop raw update in elements 9 the organize has begun to change modify dates in various ways. Sometimes if the photo is edited it will change the date to date of the edit. It also appears that the type and severity of the change is dependent on file type, (tiff, jped, psd, etc...). The Elements team sent me an update this AM. Good news. This issue will be addressed by a hotfix. The team is readying the fix but they didn't have a timeline to share. I'll keep folks informed as things develop. Is this a fix for the Windows problem (doesn't support "YYYY MM DD" format), or for the OS X problem (shot dates aren't extracted correctly from the EXIF and therefore create random directories). Unfortunately this thread got kind of hijacked by the Windows issue, but the more severe problem is the OS X bug. The Elements team has a fix that's that's going through testing internally. They'd also like to get feedback from a few users before distributing it more widely. I'm looking for a few volunteers to try it out. If so, reply with a comment to this thread with simply "I am interested" (You don't need to post your email address). Thanks! PS - According to the team the fix should cover both the Mac and Win issues described here. Thank you for the fix! I'm using Windows 7, 32 Bit, German Version. I did various tests and all where OK! The work around with customer groups is still working. So I'm very pleased now! Sweet. Thanks for the update. Be sure to let Sachin know directly as well. Thanks guys. I've submitted names to the engineering team. I've tested the fix on OS X, and the random date problem has been fixed! I've also sent an update to Sachin, with some additional details. Thanks for escalating the issue; I had given up already and switched to organizing media by import date instead. I'm happy to switch back to my original workflow again. good if this thing seems to make some progress. "Since years (since Version 5) I used to let the organizer create a folder jj mm dd which is 2 characters shorter than the provided, but unfunctional jjjj mm dd. Years ago I asked Adobe to include jjmmdd (without spaces in the folder name). This would be much better if you let a program make webpages from a folder. These spaces always translate in badly readable html%20folder%20names. So I ask Adobe for a solution to make the folder names that the organizer creates USER DEFINEABLE FOLDER NAMES, as it has been done in version 10 with the file names of the photos. This *seems* to work well." There are TWO more serious bug in the same "area" of the organizer. Nobody can want such a numbering scheme. Please let this be fixed. My camera, a Casio FH100, is able to make up to 30 full size pictures per second. If I import such a foto series with PSE organizer, the sequence of the pictures is completely mixed up. They should be in the sequence as they have been recorded. The original file names have this correct order.The time stamps of the files do not, since they have only whole seconds available. Thanks for you attention, I hope it it is worth my time. I do not want to wait until version 11 and pay again for such basic features.. I try to get photos from Camera and use Photo Downloader. I select Shot Date (yyyy mm dd) but actual subholder made was yyyy dd mm. Photo Downloader for element 10 has bugs. I figured out a work around for mine for now. I am using Mac Lion, PS Elements 10, in the downloader I chose 'Creating Custom Groups'/Custom Groups(Advanced), this gives you a section just underneath that then has another option for the Group Name, I choose the Shot Date that I want. You will notice that if you just choose Shot Date from the menu there is no folder name listed on the left side of the screen just above you pictures however if you choose the way I specified above there is an hierarchical type of display which shows you the date of the photos and on the right side of of that a folder name. Any news on an Adobe fix for this ? Just purchased PSE 10 and realized having the same issue with my photos being loaded into random date files vs the correct 'shot date'.